Is your small business’ lead conversion process in need of an overhaul? Could your clients be happier? Do you have difficulty converting online leads and referrals into clients? Do you find yourself giving the same answers over and over to leads and clients? Do you wish new clients were better informed about your services and how your business works? A lack of responsiveness and access to FAQs is a common frustration of small-business leads and clients, and can significantly hamper business growth and client happiness. Similarly, solopreneurs and small-business owners experience frustration with their limited time, which prevents them from responding promptly to leads and clients. In this webinar, Matt Bradford-Aunger, the education lead at HelpDocs.io, and Maddy Martin, Smith.ai's head of growth & educaton, will identify essential processes, services, and tools that SMB owners can implement to ensure potential and existing clients get the information they need quickly, accurately, and consistently. How to best incorporate FAQs, including how to address content, placement, and format. Registration is free! Sign up now on Livestorm to secure your spot. Please share this link with your small-business friends and peers, so they also have the opportunity to participate. Sign up even if you aren't available to join the live session, as we will email you a recording after the event, which you can listen to anytime! Matt is the education lead at HelpDocs.io, the software that helps businesses create an authoritative knowledge base to guide users when they're stuck, reduce load for support teams, and provide a better user experience. He’s spent many years in marketing and customer support, and is now focused on helping HelpDocs users get the most from their knowledge bases and FAQs. Matt can be reached at matt@helpdocs.io. 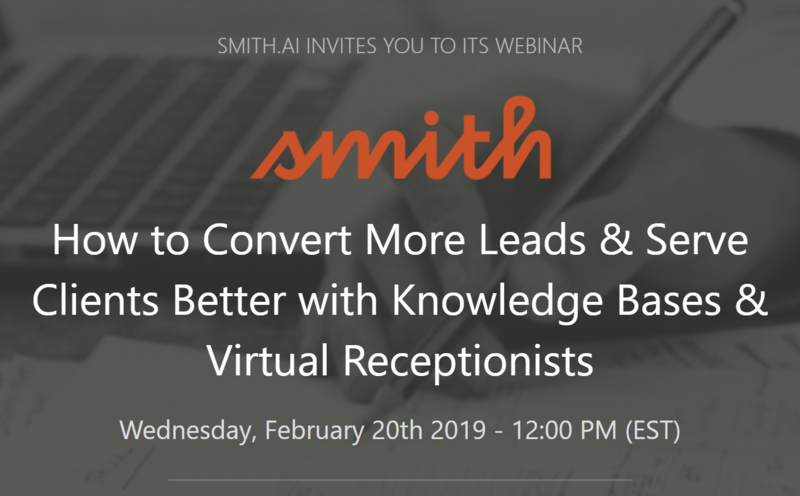 Maddy is the head of growth and education for Smith.ai, which provides small-business communication services, including their virtual receptionist & intake service, live website chat, and Keypad cloud phone system. She has spent the last decade growing tech startups from New York to California, and has expertise in digital marketing, small business communications, lead conversion, email marketing, SEO & content marketing, social media, comarketing, and event marketing. Maddy can be reached at maddy@smith.ai. If there are specific questions that you would like Matt and Maddy to address during the webinar, please email Maddy at maddy@smith.ai and she and Matt will do their best to incorporate them into the program.